Hedi Slimane photographed Georgia May Jagger for the September issue of Harper’s Bazaar US recently and I couldn’t help but think how much those photos reminded me of Jerry Hall – Georgia’s model mama. Mama Hall seems to have passed along a few trade secrets to her baby girl. 1. A pillar of strength, Georgia May Jagger poses for Hedi Slimane. 2. Just me and my shadow. Jerry Hall certainly has opened a door for Georgia May. 3. Waves, curves and a twist. 4. 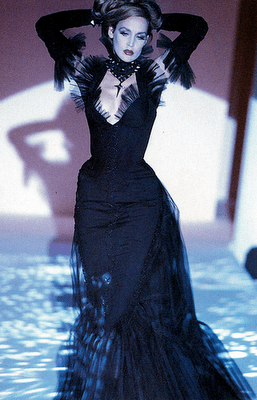 Curves and couture - Jerry Hall in Thierry Mugler - a classic combination. 5. The Siren - as photographed by Richard Avedon. 8. ...or was she meant to walk in her mother's footsteps? 13. Hold on to what your mama gave you, sista. 14. Thankfully, she's still hanging on to a little for herself! See more Georgia: Rimmel London’s Honky Tonk Women. See more Jerry: Déjà Vu: Love Scenes and Jerry Hall: Still a Southern Girl at Heart. Photos 1, 3, 6, 7, 9, 11, 13 by Hedi Slimane. Image sources for remaining as follows: 2, 4, 5 – Richard Avedon photo, 8 – Getty Images, 10 – John Rogers photo courtesy of vH1, 12, 14 – Life photo.